The third instalment in the Viva la Dolce language series expresses one of my all-time favourite quotes! 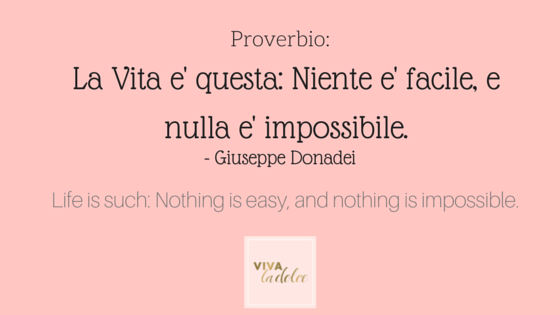 This is just one of many inspiring quotes by Italian author, Giuseppe Donadei. I love the rawness of this quote. It blankly states the hard-to-swallow, ultimate truth, that life isn't easy. However, Donadei nicely juxtaposes this idea with the uplifting thought that, "nothing is impossible." It is a reminder that while things may not always be easily attainable or may not always run smoothly, there is always hope as anything is possible. On the language side, Donadei uses the negative indefinite pronouns, "niente" and "nulla." Both mean the same thing, "nothing," and can almost always be used interchangeably. However, be aware of the following rule when when using these words: when "niente" and "nulla" are placed in front of the verb, for example, "Niente mi piace" (I don't like anything or Nothing is pleasing to me) or "Nulla è cambiato (Nothing has changed)," they create a negative connotation without having to add anything to the sentence. However, when either of these two words are placed after the verb, you need to add the double negative, "non," to create the negative significance. For example, "Non mi piace niente," and "non è cambiato nulla."